As osrs will be released for everyone in late October, I'd really like to see a site like this optimized for mobile players. I'm no web guy so maybe you've looked into it and are either working on it or it can't be done but I think its essential in this day and age. 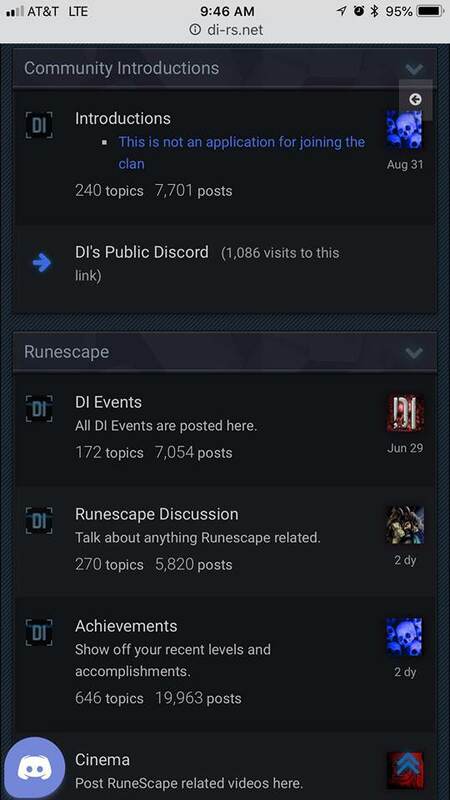 (09-17-2018, 02:07 PM)Dox17 Wrote: As osrs will be released for everyone in late October, I'd really like to see a site like this optimized for mobile players. I'm no web guy so maybe you've looked into it and are either working on it or it can't be done but I think its essential in this day and age. How do you mean optimized? The site runs perfectly fine on mobile. Do you mean a mobile skin? Just compare rsc to di's site. the rsc site tries to fit the entire page onto the screen which means the user has to zoom in and click on the link to the subforums which can be difficult for people with larger fingers. DI's site is a lot more mobile user friendly right off the bat. Ye I got you, that's a skinning issue not an Optimization issue, we just need a mobile skin installed that's all. Then yes, I recommend a mobile skin. 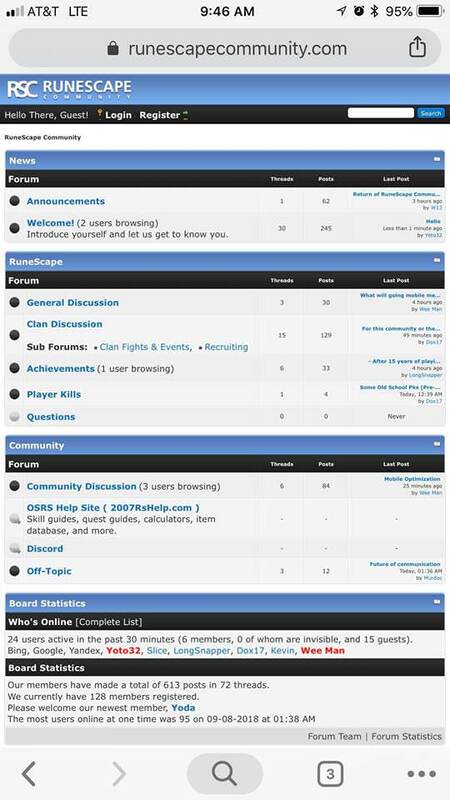 Making a responsive default skin is one of the top priorities of myBB's development team. But if they take too long, there are mobile-friendly skins we can install here. I'm not a big fan of many skins because it multiplies the work when making modifications to the skin. Good thinking. A dark mobile skin would be nice. OT: I’m still genuinely confused on why the RS website isn’t as mobile friendly. Doing anything on it on a phone is almost not worth attempting. Any way of getting a Lite Mode that people can post with? (09-18-2018, 11:24 PM)Murdoc Wrote: Any way of getting a Lite Mode that people can post with? I think that'd have to be a separate skin and we're trying not to have too many.